Since we can have great tomatoes year around, we can always enjoy their fresh flavor this way. Remember: Never store your fresh tomatoes in the refrigerator, the cold ruins their taste and texture. Keep them right on the counter so they'll be sweeter and juicier. 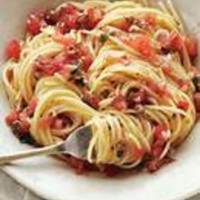 In a large bowl, combine the olive oil, 1/2 teaspoon salt, basil, garlic, black pepper, tomatoes, bell pepper and scallions. Toss to coat; set aside for 30 minutes. Meanwhile, add 1-1/2 teaspoons salt in a large pot of boiling water; add the linguine and cook until al dente' (tender but still firm), 8 to 10 minutes. Drain, rinse with warm water, and drain again; place back in hot pot. Pour hot chicken stock over linguine. Add tomato mixture over pasta and let rest (covered) on warm part of stove for 30 minutes. Do not mix. The pasta will absorb most of the liquid from broth and tomatoes. After 30 minutes add cheeses and toss with pasta; serve warm. This recipe is great when you use angle hair pasta. If you want to make a meal/vegetarian, try using Ronzoni's Garden Delight Fettuccine and use vegetable stock instead of chicken. I like this pasta recipe.. thanks! Your welcome, glad you enjoyed it.